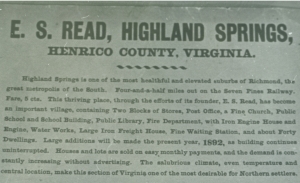 Highland Springs is an unincorporated community about 4 miles east of Richmond in Henrico County. It was established in 1890 by Edmund S. Read, a Boston businessman who came to the area seeking a better climate for his wife who was in ill health. Highland Springs was laid out in a grid pattern along Nine Mile Road which was the path of the Seven Pines Railway electric streetcar from Richmond to the Seven Pines National Cemetery. Seven parks were included in the plan, several of which were the sites of the springs for which the area was named. Streets were named alphabetically for trees and shrubs and the building lots were predominantly small in order to be affordable for the area’s families who were seeking home ownership. 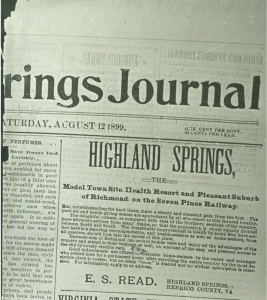 Highland Springs developed into a community with many commercial, religious, educational, civic, and recreational uses. Most housing was modest and in vernacular forms however there are many examples of architectural styles including Queen Anne, Colonial Revival, Craftsman, Minimal Traditional, Ranch, Tudor Revival, and Italianate. One of the most recognizable buildings in Highland Springs is the Henrico Theatre, designed by Edward Sinnott. The Art Deco style theatre had an air-conditioned auditorium and state-of-the-art film projection technology when it opened in April 1938. It was added to the Virginia Landmarks Register and National Register of Historic Places in 2005.